Cage covers designed to help your bird feel safe and secure at night time whilst providing them with 12 hours of essential darkness. Did you know that most Parrots need around 12 hours sleep per night? Most people only need 6 or 8 hours and that difference can have a big effect on your bird`s wellbeing. Cozzzybird cage covers are made to provide your bird with the warmth, darkness and security needed to allow a good night’s sleep. Because of our schedules, our birds often suffer. Increasing the amount of sleep that your bird gets to 12 hours each night will not only greatly improve your bird`s temperament, but more importantly, their health. Birds also like to feel secure. Their natural habitat is often in the rainforests where they can sleep high in a tree, protected by the foliage it offers. A bird cage cover will give them the same security that a tall tree gives in the wild. Cozzybird cage covers feature an innovative front flap secured with Velcro on both sides. This can easily be lifted to allow access to the cage door without removing the cover. This flap also makes the cage cover extremely easy to fit. 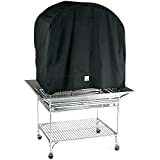 Although the cover fits snugly around the cage there is ample room to allow for any external feeders or other fixtures. This entry was posted in Birds and tagged 64x32x70, Cage, cover, Deluxe, Dometop, inches, Suits by One Boutique. Bookmark the permalink.